Abstract: This project started with a trip to the Murano Glassworks landfill in Venice. Art-glass fragments broke through the surface in brilliant, but imperfect second comings, like breathless bones rising before the Final Judgment. Images from this visit inspired two site-specific art installations: Attrition and Contrition. Intermingled religious references appear throughout. Old Testament Hebrew names for God and Koranic Names for Allah adorn forms rising from a symbolic landfill to a mandala-like canopy. Visual references are made to the rainbow, sign of the God’s covenant with Man. A Miserere and a Kyrie Eleison by the author are sung in the background. The Fibonacci numbering sequence and the Golden Mean reference universal harmony. Symbolic interaction theory analyzes society − and here, art − by addressing subjective meanings people impose on objects and events. This paper illustrates how symbolic interaction serves as a theoretical base for interpreting visual components within these installations and the installations themselves. Both views of the artist and assessments from students within the context of introductory design studio concepts classes are considered here. Effectiveness of the art installations can be evaluated in terms of symbolic interactionism. The artist can use these studies to anticipate responses to future installations. Deciphering ‘Judgment’: Symbolic Interactionism within Art Installations. 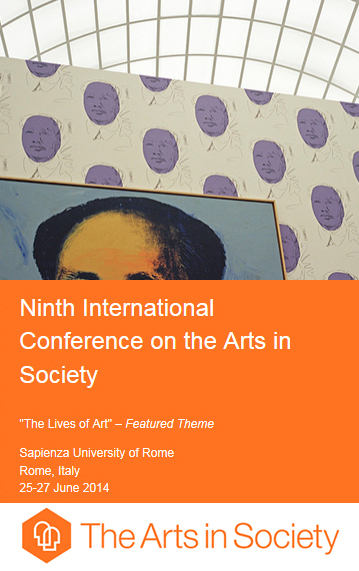 Houser, T. and Kwon, J. Apublished in proceedings, 9th International Conference on the Arts in Society, Rome, Italy, Jun 25-27.